The gospel is of first importance – not spiritual gifts, politics, tithing, etc. No, the gospel is of first importance because it is the avenue through which God through grace through faith in Jesus Christ and his work on the cross restores sinful men to him once and for all for eternity to enjoy and know him. (Romans 1:16, 1 Corinthians 1:30-31, John 17:3). With that being said, I would like to identify Art Heinz of Hope Harbor Church as a false teacher who preaches a false gospel commonly known as the “prosperity gospel”. I would also like to make clear that Hope Harbor as a whole is a false church and any believers attending should leave and find a church that is truly Christ centered in every aspect focusing on the gospel. The “prosperity gospel” is a heretical teaching based on using God as a means to an end to achieve health, wealth, and well- being. God is painted as Santa clause- a being whom you obey to get good things. It’s always what God can do for you i.e provide material things, good health and financial security. Popular false teachers of this are Kenneth Copeland, Joel Osteen, Joyce Meyers, T.D Jakes, Benny Hinn etc. It’s never the true gospel which is man is depraved and in need of a savior and we have fallen short of God’s standard of perfection and deserve hell for our sin. The good news is God has shown us grace and mercy and satisfied his justice by sending Jesus Christ to atone for our sin and restore us to God. That leads us to a lifestyle of repentance and trusting in Christ fully and a desire to know him and make him known (Romans 3:23, Romans 6:23, Ephesians 2:8-9, Luke 9:23, Ezekiel 11:19, John 17:3). Before you dismiss this article as “judgmental”, “critical” or not in a spirit of love, you must first realize that God calls us to make righteous judgment (John 7:24), identify false teachers and their false teachings and warn others (1 John 4:1) and have nothing to do with such people who are spreading false teachings that damn people to hell (2 John 1:10-11). This is all done for the glory of God. God’s word which are the Holy scriptures should be true Christians' source of authority because in it God has revealed his will and most importantly himself. We are not called to go off our emotions, not how nice Mr. Art Heinz is, how comfortable we are at his church but we are called to go off God’s word and whether his teachings line up with God’s word and the true gospel is being spread to lead men back to God for his glory. 2 Timothy 3:16 – “All Scripture is God-breathed and is useful for teaching, rebuking, correcting and training in righteousness,” Matthew 4:4 “Jesus answered, “It is written: ‘Man shall not live on bread alone, but on every word that comes from the mouth of God”. One section of scripture defines Art Heinz’s and Hope Harbor’s teachings – 1 Timothy 6:5, 9-11. 1 Timothy 6:5 –“and constant friction between people of corrupt mind, who have been robbed of the truth and who think that godliness is a means to financial gain” and 1 Timothy 6:9-11 “Those who want to get rich fall into temptation and a trap and into many foolish and harmful desires that plunge people into ruin and destruction. 10 For the love of money is a root of all kinds of evil. Some people, eager for money, have wandered from the faith and pierced themselves with many griefs. But you, man of God, flee from all this, and pursue righteousness, godliness, faith, love, endurance and gentleness”. If Art Heinz was truly preaching to make Christ known and know Christ focused solely on the gospel, he wouldn’t have his sermon page dedicated to the prosperity gospel. All his sermons are dedicated to being “restored” to receive certain “blessings” from God . His sermons are man centered i.e it’s for the benefit of the individual to receive things from God painting God as a “blessing vending machine”. For example, in his sermons “Impostors” part 1 through 13, he dedicates his time to pointing out sin that prevents God from blessing an individual. This is a classic aspect of the prosperity gospel. It plays on the hearer’s mindset to think they can do something to warrant God’s grace and the privilege to receive God’s blessing by trying to do something for God. I'm not saying sin doesn't push away from God (Isaiah 59:1-2), I'm saying that you cannot incite God to "bless you" based on your works. (Isaiah 64:6). This contradicts scripture like Acts 17:25 “And he is not served by human hands, as if he needed anything. Rather, he himself gives everyone life and breath and everything else.” Secondly, we can only experience God through Jesus Christ because God is holy meaning he is set apart and he cannot look upon sin. Habakkuk 1:13 . Jesus Christ is our mediator 1 Timothy 2:5. What can a sinful man do to appease a Holy God? - Nothing. Art Heinz calls Jesus Christ Lord and indeed he is but the danger of Art Heinz’s teaching is that he is offering his hearers who is misleading to hell “blessings form God” as an incentive to recognize Jesus as Lord not by virtue of Jesus being the son of God and his work on the cross to restore us to God (John 3:16, 2 Corinthians 5:21, Philippians 2:8-11). That is idolatry. What good are these “blessings” if we don’t have God for eternity? Art Heinz promotes a false gospel. The incentive for coming to God through Jesus Christ is God. Romans 2:4 is clear – “Or do you show contempt for the riches of his kindness, forbearance and patience, not realizing that God's kindness is intended to lead you to repentance?” God because of who is he is, not what he can do for you i.e “blessings of finances, breakthroughs, health” is what leads men to repentance. Only when God’s holiness, justice, mercy, grace and his attributes are preached pointing back to the cross is his goodness shown that leads men to repentance which is the gospel . Art Heinz is more focused on preaching heresy that damns people to hell. His teachings do not call for repentance and the uplifting of Christ. Art Heinz does not preach a gospel of repentance and grace through faith in Christ uplifting Christ. He preaches a false gospel that seeks to uplift man as the center and what he can do to receive “blessings” from God and not God. The excuse of Art Heinz is preaching “solid food” and not milk is not an excuse for his false teaching. Jesus Christ is the author and finisher of our faith (Hebrews 12:2). Everything points back to Christ. So whether a preacher is preaching on marriage, politics, tithing etc. it will always point back to Christ. The solid food spoken of in Hebrews 5:12-13 refers to the deeper mysteries of God revealed in his word that lead back to Christ not the false teaching of prosperity. Art Heinz and Hope Harbor do not promote the gospel. 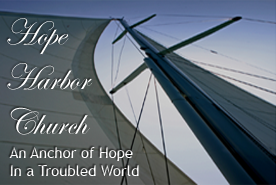 Let me cite one of his sermons on the hope harbor website. In this sermon, Art Heinz specifically twists scripture that points to the promise of Christ to restore sinful men to God to meet the needs of his prosperity gospel teaching which is false. In his sermon titled “The Comeback”, Art Heinz quotes Isaiah 42:9 - “See, the former things have taken place, and new things I declare; before they spring into being I announce them to you” and Isaiah 43:18 – “Forget the former things; do not dwell on the past”. Art Heinz twists these scriptures to tell his hearers their “setbacks” will be no more because he perceives it in his spirit. The problem with this is those scriptures point to God’s promise of sending Jesus Christ to save fallen mankind which was a prophesy given to Isaiah for the Israelites because Jesus Christ was to come through them and redeem mankind. As you can see here, Art Heinz twists this scripture to suit the conditions of the hearers instead of giving the actual context and leading it back to Christ. All his sermons found on http://www.hopeharborchurch.com/sermon.php – season of fall part one, two, three, season of spring, season of summer, season of winter, impostors 1 to the 13, the comeback kid, accelerating the comeback, barriers to the comeback, the comeback, all have a common theme. The hearer is told to use God as a means to an end with “blessings” being the incentive to serve Christ. You can compare all his sermons to this resource right here and see that Art Heinz’s teaching is deeply rooted in the prosperity gospel - http://www.gotquestions.org/prosperity-gospel.html . This link contains scripture on such false teachings. A few things to point out- On Hope Harbor’s website it is shown that Hope Harbor Church is affiliated with the campus ministry Christ Ambassadors headed by Mark Randall. What is disturbing is Mark Randall attends Hope Harbor Church and this ministry is connected to Hope Harbor. Knowing that Art Heinz preaches false doctrine that condemns people to hell and Mark Randall has no problem identifying with such a Church, I would recommend true believers not to join that ministry that promotes the heresies of Hope Harbor Church. I also question the salvation of Mark Randall because he supports such a wicked ministry. I have emailed Art Heinz and Mark Randall with questions on why they had a woman listed as senior pastor known as Kelli Heinz. I also directly confronted Art Heinz on spreading a false gospel. The responses I received via email were less than favorable as they didn’t address the issue. If it comes to it, I will release the emails. You can find Art Heinz's affiliations on his blogroll for his site http://hhcpastor.wordpress.com . In conclusion, if you claim to be a believer and you are attending either Hope Harbor or Christ Ambassadors, you need to leave. To Art Heinz and Mark Randall, you guys are misleading people to hell with your false teachings. I pray you guys read this and turn to Christ or perish. God’s word trumps your opinions. Believers go off scripture – First Thessalonians 5:21 – “but test them all; hold on to what is good,”.